Memphis' Tony Allen has a bit of a reputation in the NBA. He's a great lockdown defender, and up until this year he was known less for his offense and more for missing jump shots and tearing his ACL on plays that had been blown dead. 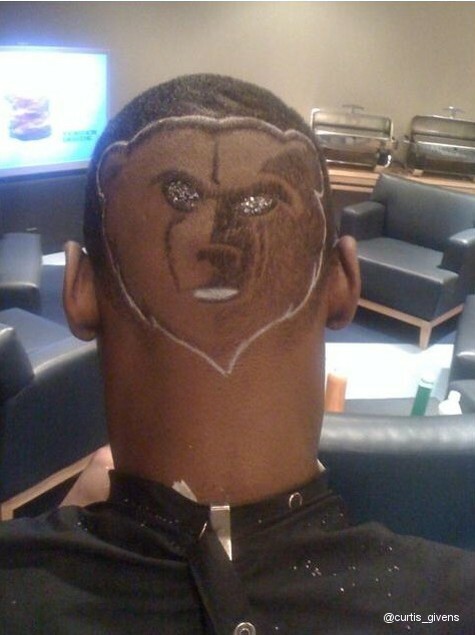 Well, he promised a new 'do prior to Game 4 of his team's opening round series against the Spurs. Sadly, that haircut was axed before the game, and it seemed like it was just all talk. Well, the look has finally been tweeted (via Fox Sports Memphis radio host Chris Vernon), and it is pretty amazing. Yes, there is added glitter and chalk, but that doesn't deter from the fact this man had a grizzly shaved into his head. There's just an unspeakable level of awesome about that. Perhaps if Gary Neal hadn't made a ridiculous three and the Grizz had won the series tonight, the waif would be back. We can only hope if Memphis does move to round 2, a new Tony Allen will emerge.